Way back around 1984 or so Bandai America was importing Japanese toys under the brand name Godaikin. The assortment of toys was random, mostly consisting of whatever Bandai Japan was producing at the time. Of course, you got your assortment of giant robots, but a few of the robots had a noticeably different feel to them. Instead of firing fists and lions, you got an interesting 80s aesthetic. 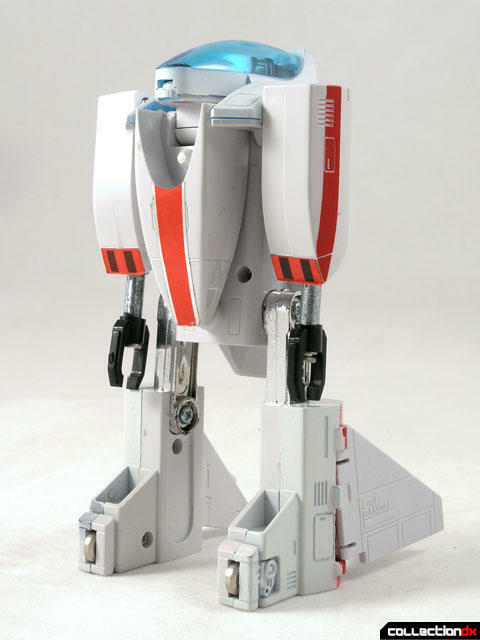 White metal, red highlights, and chrome metallic appendages – it was very cutting edge at the time. The age of LCD watches had come and it had influenced toy design. Laserion. Vavilos. Abega. All were products of this school of design. 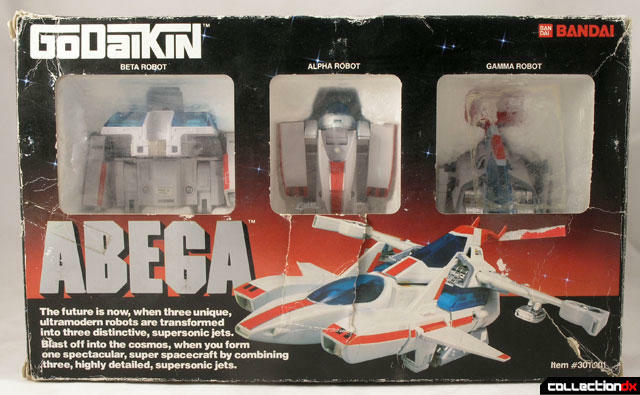 The Godaikin Abega consists of 3 robots that transform into jets as well as combine into one larger ship. 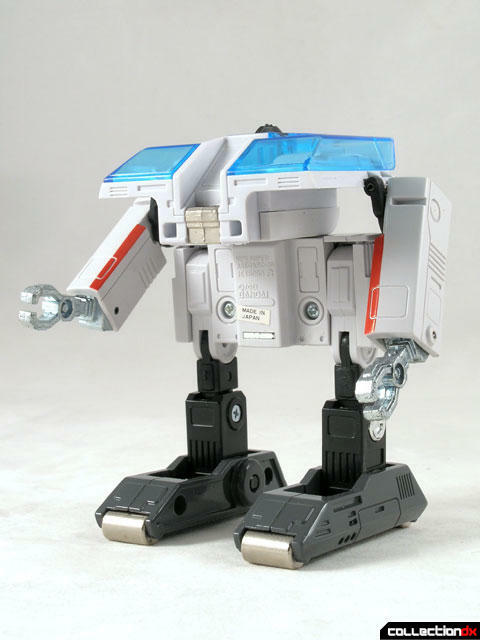 The original toy was called the New Super Abega Jetrobo DX Popynica, manufactured by Bandai Japan in 1983. 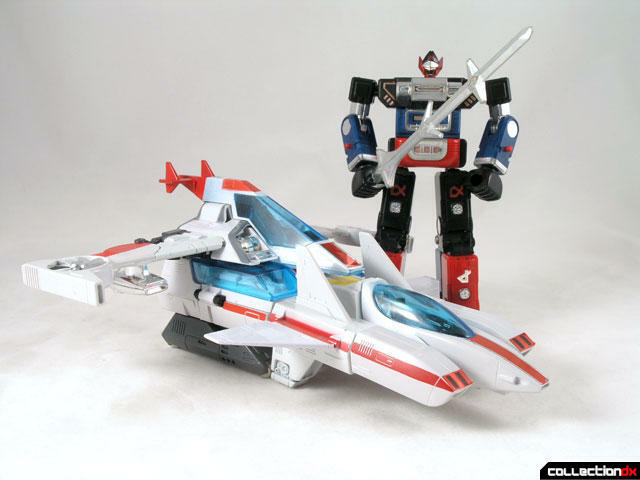 It came from the show Albegas, which was to become Voltron II in the United States (it never aired, but the toys for Voltron II hit the stores in 84). Each robot has a vehicle mode and a robot mode. The toys are mostly plastic, with metal being reserved for chrome limbs and select body parts. I’d say 25% of each toy is metal. 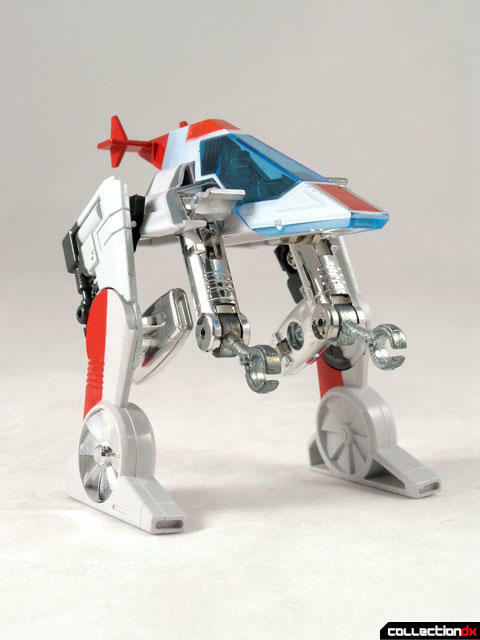 The three robots combine in vehicle mode to form the Abega Jetrobo. This combination is not too solid, but it holds together fine. Bandai must have been going through a weird phase at this time. 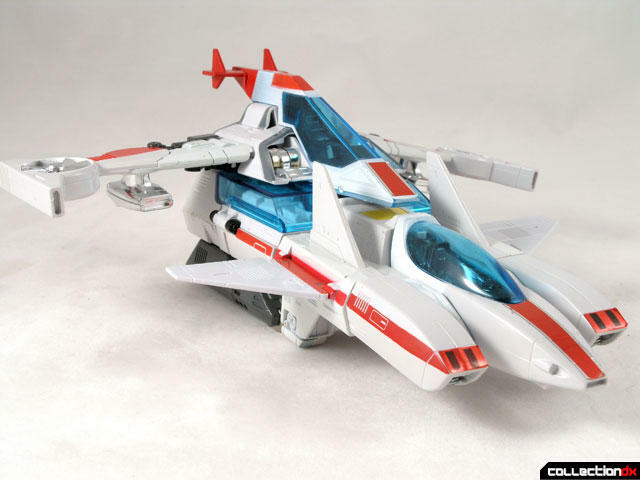 This toy (as well as the DX Albegas) shows some really innovative design, but some really poor construction choices. The wings and arms have a tendency to break on these due to a bad choice of material. The hinges on each of the robots are especially fragile. If you’ve been toy collecting for a while, you’ve undoubtedly seen the corpses of broken Abega toys littered in transformer lots throughout eBay. It’s an interesting toy, but not a particularly rare or desirable one. If you find one unbroken, it’s worth picking up.